The new Corvette Stingray is able to talk to its driver in ten ways, but it always shows the driver what is needed on that particular drive. The 2014 Corvette Stingray is a car that owners will use in three distinct ways. Drivers may use it as a touring car for back-roads cruising, they may use it for hard-driving on a closed course or in a situation where putting the performance to use is safe, or they may actually be on track in a competitive situation. Thinking ahead, the Corvette Stingray designers planned the information display to suit all three of these scenarios. Explaining how the 8 inch liquid crystal display at the center of the drivers gauge cluster can change depending upon how the driver chooses to use the car, Jason Stewart, General Motors interaction designer said “the touring theme places more emphasis on multimedia and infotainment; the sport theme emphasizes performance features with a prominent shift indicator and a large radial tachometer; track theme offers a race-inspired layout containing a sweeping tachometer, Corvette racing inspired shift lights and permanent lap-time displays. Each of these three themes can also be configured so that drivers can personalize their experience in the Stingray.” Clearly the information most needed can be called upon in any driving scenario. 1. Tour theme – The most modern display, this view provides essential vehicle information drivers want for daily driving and includes mostly infotainment information. 2. Sport theme – This view gives the driver a big ‘ole tach right in the center of the dash. 3. Track theme – Taking its theme from the racing C6.R Corvette, this view provides a modern grahpuic tachometer and shift lights. 4. 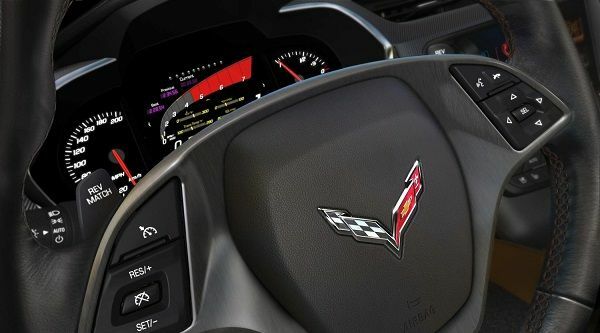 Adjustable redline – Drivers can input their own redline below that of the Corvette’s design maximum, should they wish. 5. Tachometer ‘halo’ – In this view the tachometer gets a yellow halo as the car approaches redline and that changes to red as the redline is reached. Similar to the Lexus IS display. 6. Shift lights – Taken again from the racing Corvette, this “when to shift” indicator turns from green to yellow then blue and will flash at when the car is at the redline in an effort to assist the driver in situations where his attention is on the track, not the dash. 7. Friction-bubble/cornering force – This is a view that let’s the driver see how many G’s are being pulled and relates them to the car’s design maximum (which is over 1G laterally). 8. Tire temperature gauge – Displays the TPMS tire temperature so drivers can see when tires are properly warmed up for track use. 9. Acceleration timer – Gives the driver a way to record his own 0-60 times and a few other set performance metrics. 10. Lap timer – Displays a drivers lap time and records best times to help a driver get the most from any given track. The new 2014 Corvette Stingray’s display is just on of the many amazing features of the car.